Seattle (Special to Huntingtonnews.net) – In his book, Controlled Violence, Sam Huff writes that in 1969 Billy Kilmer, quarterback of the New Orleans Saints, had a reward of $100 for anyone who could knock him out of a game. Huff did not learn about it until several years later when Kilmer, who had been traded to the Washington Redskins, told him. Huff’s book was published before the recent scandal that tarnished the image and reputation of professional football and cost the New Orleans Saints the stiffest penalties in NFL history. This was not the first time bounties had been placed on players of opposing team. Huff’s relentless pursuit of the ball carrier and being tough, aggressive, fast and quick made him possibly the first target for a bounty. 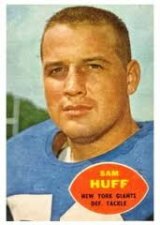 From 1956 until he was traded to the Washington Redskins in 1964, Huff was captain of the greatest defense in football history. As the middle linebacker in Tom Landry’s innovative 4-3 defense, Huff was responsible for leading the New York Giants to six championships in eight years. In 1969, his final season as a player, the Redskins’ opened against the New Orleans Saints. “In the second quarter I flat-out leveled their Billy Kilmer and he now reminds me of it every time we see each other,” says Huff. “In the second quarter with the Saints leading 10-0, we flushed Kilmer out of the pocket and he ran toward the sideline, then came back across the field and was heading to the other side,” Huff writes. “I was behind him the entire time. Just as he got in front of the Saints’ bench, he stepped out of the bounds. At the same time, I hit him with a shot that knocked him straight up in the air and threw him back so far that he landed on a table in front of the team bench. Not only did he break the table, but he bruised his hip. “The Saints emptied their bench and came after me, as did their owner, John Mecom, Jr. I was getting pounded when the officials came over to stop it. Years later Billy told me that after that hit, he put a reward out on my head. Any player who could knock me out of the game would collect $100 courtesy of Billy Kilmer.” The Redskins took the lead in the fourth quarter gave Vince Lombardi his first Redskins victory. Three people who would have an idea regarding teams playing players bounties or bonuses to injure opponents are Charlie Sumner, Larry Peccatiello and Fred Wyant who spent 97 years of their careers in professional football. While 65 percent who responded to a survey in The Seattle Times thought the penalties were “about right” another 23 percent thought they were “too heavy because every team does it.” This certainly is not the image the NFL wants. I talked to the three following the penalties handed out by the NFL against the New Orleans Saints and all agreed that during their careers they had not experienced any such bounty situations. “We never had a bounty on opposition players. Our intention and efforts were to hit them in order to keep them from completing their mission, especially the quarterback so that he threw early and not with accuracy,” said Charlie Sumner, who played defensive safety for eight years and went on to become one of the best defensive coordinators in the NFL with the Oakland Raiders, Pittsburgh Steelers and New England Patriots. “You could end a player’s career with that type of action and we, obviously, lost some great players. Brett Favre was certainly eliminated from doing his opponents anymore harm.” Sumner coached eight players who were inducted into the NFL’s Hall of Fame. “Never in my 29 years in the NFL was the word bounty ever uttered or the topic discussed,” said Larry Peccatiello who earned three Super Bowl rings when he was responsible for the defensive unit of the Washington Redskins. “In reality, how can a player, doing all he can to bring a Tony Dorsett or the like to the ground and also have the ability to take him out? The only way possible to intentionally hurt an opponent is to hit him late, down or well after a ball has been thrown, both resulting in 15 yard penalties and a first down. “Many teams do have reward systems for big plays, interceptions, fumble recoveries, no fumbles and tackles inside the 20-yard line on kickoffs, but never add ons to those plays for cart offs,” Peccatiello added. He also was defensive coordinator for the Cincinnati Bengals and Detroit Lions. Fred Wyant was a quarterback for the Washington Redskins and Toronto Argonauts before being an NFL official for 27 years. “As a referee one of my jobs was to protect the quarterback,” he says. “Bounties were a nonoccurrence. I never saw anything that would even hint of a bounty. However, I was in charge of three games that ended the careers of three greats – Bo Jackson (Los Angeles Raiders), Joe Theisman (Washington Redskins) and Gayle Sayers (Chicago Bears). All were clean hits. The players just got caught the wrong way and hit in the wrong place. Wyant and Huff were teammates on the greatest football teams in West Virginia University history.